It never seemed likely to work, right up until it did. Mexican and Korean? Really? Latin American and Asian? Are you kidding me? And from a roach coach? Only it did work. It really did. 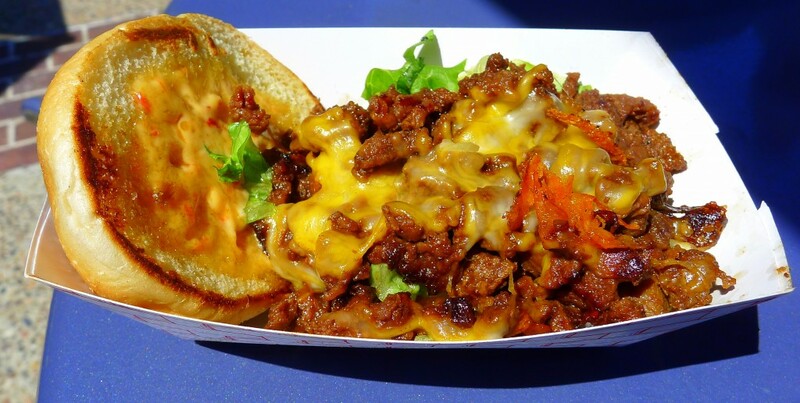 Roy Choi was the first to do it with his Kogi BBQ Taco Truck in Los Angeles in 2008. The Tabe BBQ food truck in San Diego wasn’t far behind, patrolling San Diego streets by 2010, offering its own take on Korean-Mexican fusion tacos and burritos curbside (@tabebbq on Twitter, with daily locations listed at sdfoodtrucks.com). The food at Tabe (pronounced “tah-bay”) is at its best when it’s closest to the core idea: Korean-barbecue fillings inside tortillas. Perhaps Tabe’s best dish is its spicy-pork taco. One bite and suddenly that counterintuitive Mexican-Korean-fusion thing starts to make sense. A deep, full, meaty flavor with hints of heat and a layer of sweetness, it was a flavor profile I immediately recognized as more than just a bit like tacos al pastor. Of course it works. Tabe’s tacos come in flour tortillas, not corn, which is an unfortunate choice. In addition to the spicy-pork version, filling offerings include barbecued beef, chicken teriyaki and fish. The chicken-teriyaki taco is unimpressive, and I’m far from convinced that the world really needs another battered and deep-fried fish taco. But the barbecued beef—more galbi than bulgogi—is excellent: tender, sweet with deep umami and just a hint of the thrill of the grill. Tabe’s burritos work less well. Fusion wraps were novel in the ’90s, less so in the ’00s. In the 20-teens, fusion wraps—and, let’s be honest, that’s what a Korean-Mexican burrito is—are a tired idea. Moreover, instead of adding layers of flavor, adding boatloads of rice just makes the dish a gut buster. Tabe’s sliders work better. Direct and no nonsense, these are meat on a bun with the addition of cheese. Korean-Mexican fusion? No. Korean-American fusion? Check. Here, the beef filling works better than the pork. And Tabe’s Chinese five-spice-laced french fries are equally good. They are perfectly fried, and the spice enhances the potatoes’ natural flavor without overwhelming it. If Korean-Mexican fusion is an accident, it’s one of Southern California culture and geography. Kogi’s Choi didn’t just grow up in Korea Town; he grew up in Los Angeles brimming with cultural cross-fertilization, if sometimes by crashing those cultures against one another. At Tabe, and Kogi before it, that crash proved to be a happy accident. In its four-year history, Tabe has been through a number of incarnations. Personnel has changed, chefs have changed, locations have changed and business plans have evolved to adapt to a changing environment. What hasn’t changed is the essential idea of combining our American notion of street food with Eastern, primarily Korean flavors. And while that Korean-Mexican idea may seem counterintuitive at first, that impression will likely last only until the first trip to the Tabe truck.